For the price range that you’ve selected, the following cars are your stepping stones to the world of 4-wheeled personal transport. The hatchbacks in this segment are the best option to go for if you’re looking at a moderately comfortable transport for four, with comfort features like an air-conditioning unit, an easily maneuverable city-centric transport and a moderately strong body that will save you from the changing weather elements outside. Mind you these are the most basic of all cars running on the road, and though these cars do offer good equipment you cannot expect more for the price you are paying. You should be interested in this segment only and only if you are a first time buyer, moving from two-wheeled transport to 4-wheeled transport and have a limited budget. The cars we are comparing today in our Best Hatchbacks in World between 2 to 4 lakhs are the Renault Kwid, Tata Nano, Maruti Suzuki Alto 800, Hyundai Eon and Datsun Go. One of the strongest selling points of the Renault Kwid is its styling, which has been inspired by multiple Renault SUVs and crossovers. And it’s not just the exterior that seems to have caught everyone’s attention. The cabin is also well designed with premium bits like the digital speedo, optional touchscreen infotainment system and more. Another area where the Kwid scores well over its rivals is the ride quality. The rear passengers will appreciate the Kwid’s sufficiently soft suspension and aren’t likely to ever complain of a harsh ride that mars some of the other cars in this segment. The Kwid’s suspension absorbs most of the small irregularities that our roads are famous for with quite an ease and only the bigger of the potholes threaten to unsettle this car. In one word: Cute. Though there are many who would say that it looks like an autorickshaw from the rear (we disagree). The design is pretty pleasing on the eyes. The car is okay on the inside, you get what you pay for. You get a beige interior, a silver centre console with integrated stereo system two usable glove-boxes and body-coloured elements on the dash and doors. For a car that is about 3-metres long, the Nano is pretty spacious on the inside and can carry 4 people easily. The tall cabin opens a lot of space and you just walk into the car rather than lower yourself into it. The quality of materials used inside have been improved on the new Nano and is comparable to other cars in its price bracket. NVH levels inside the car are pretty decent even though it may sound hoarse on the outside. The air-conditioning works very well and keeps the cabin comfortable for both front and rear occupants. Suspension is comfortable but firm, this stops the car from leaning too much in the corners. Driving the car is pretty easy thanks to a large steering wheel and improved clutch pedal feel. The brakes could have been improved, though. In one word: Fussy. It’s not a good looking car, for sure but doesn’t look very bad too. From a design perspective, there’s too much going on around the car, various shapes converge to give you very bulbous strange looking car. The high ground clearance and very thin tyres don’t help matters at all. Step inside and the Alto 800 is quite a step-up from the Maruti 800. Just like the outside, the front dash is mish-mash of design. Of the four A/C vents, the two above the centre console are fitted inside a semi-circular housing the other two are circular. You have a choice of two interior colours, black and brown, the brown seems to suit the interiors more. On the higher end variants, you get silver inserts around the cabin which make it look better. On the whole the interiors seem well put together, you are constantly reminded though that you are in a budget hatchback. The Alto 800 is built on the same platform as the older 800, it is taller and shorter than the previous car while the wheelbase hasn’t been fiddled with. This means that the car is not very spacious for more than 4 average sized adults. Because the car is so narrow, shoulder rubbing between the driver and co-driver is to be expected, the short wheelbase does not leave much space for the rear passengers even though Maruti has scooped out the rear of the front seats to liberate more space. Though the Alto 800 follows a tall boy design the seats are placed a bit low and you have to lower yourself into the cabin, which is not very easy. The glass area on the car is very large which gives the cabin an airy feeling.There are some cubby holes around the car to keep knick-knacks, the glove-box is of adequate size. The luggage compartment which has a storage area of 177 litres can hold small bags. The quality of the materials used inside is the same as found on the Estilo, Alto K10, Zen; you get plastics that are rough and there’s not much of anything else around the cabin. The quality of the materials inside seem just acceptable for the price of the car, especially when you compare it to the Tata Nano. The car is surprisingly nice to drive, the steering is good to hold, the gearshift is smooth and slots into place easily, the suspension is supple and can take most the abuses you throw at it. The improved 796cc engine from the older 800 makes all the difference, it is easier to modulate and has a better low-end grunt. The seats do not help if you decide to drive the Alto 800 hard, though, zero support means you would spend your time sliding around. The support in those thin seats are also potential long distance travel deterrent. In one short-sentence: Good looking. This is the only car in the segment which seems to have been given some thought in terms of design. 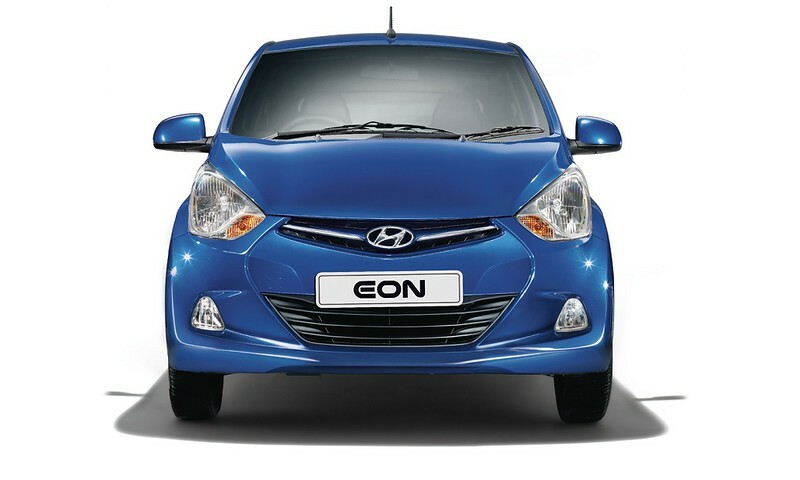 Hyundai has been bragging about its emotion inducing ‘Fluidic’ design and the Eon does have a very pleasing design inside out. The only part that looks a bit overdone is the very prominent wedge like line below the side-windows. Unlike its competition, the Eon seems well proportioned and the surfaces and lines around the car make it look a bit more premium than the other cars in its category. Step inside and the design mimics the outside, the dashboard is stylish and is coherently put together, there are no clash of design elements. One thing that will disappoint though is that the quality of materials used inside do not feel the way they look, this is the only part where the car’s budget status really show. The Hyundai Eon’s interiors look and feel much better than its competition and might warrant the slight price increase over the others in this segment. Hyundai has made a lot of effort to make the car feel more premium than it actually is, with the use of dual-tone interiors, few exposed metal bits inside the cabin and by introducing many first-in-the-segment features in the Eon. The Eon suffers from some problems though, which are similar to the Alto 800. Getting in and out of the car is not easy due to low seat height and the small dimensions of the car. It is best suited to carry four people, and the space at the rear bench is compromised for a larger luggage compartment. The snazzy exterior design also creates some problems, the upward swooping window-line results in a comparatively small rear window, which can make rear passengers feel claustrophobic. The A/C in the Eon works pretty well, and can cool the cabin within a span of several minutes in most conditions.The standard music player with CD / AUX / USB connectivity is pretty good. There are a host of storage options around the car and are actually useful. You’d have mixed feelings driving this car, the steering, engine tuning and gear ratios are more suited for city driving and a sedate driving style. The steering (which adjusts for height) is light and helps in easy maneuvering in the city but is not much of a help at speeds of over 100 KMPH, constant gearshift are needed to keep the car in a high momentum condition, the pedals are placed too close for fast movements, the engine loses breath after 120 KMPH. One serious problem with the car is the NVH levels inside, the gearshift lever vibrates a lot, and you feel the vibrations of the 3-cylinder engine through the pedals. The suspension is pliant enough and can handle most surface conditions, but does crash through large potholes. In one sentence: That’s a big, smart hatchback! The Datsun Go is the biggest hatchback in this segment, it is in fact as bigger (if not bigger) than many hatchbacks in the Rs. 4-6 Lakh segment too! Design-wise Datsun has elected to go the safe way with not too flashy styling. It does look pretty smart, we think. On the inside you get to notice why this car is so easy on the wallet though being a large hatchback; the dashboard does not have a lockable glove compartment, the plastics are hard and, on the whole, the interiors are very minimalist. But this simple design is easy on the eyes, add to that the beige plastics make the car look even more spacious which is a good thing. The Datsun Go gets a good suspension setup with long suspension travel which makes it fairly comfortable on good roads as well as bad roads. It handles much better as compared to the other cars in it’s segment, and remains stable at very high speeds too (we tested it till speeds of over 140 KMPH, you can check out the test drive review here). The seats are comfy, there is space at the back for three people to sit abreast and the best thing of all there is acres of leg room for everybody. Standard equipment on the Datsun Go is limited, Datsun offers accessory packages to those who want to spec their cars up. Otherwise, you feel a bit let down as you get into the cabin of this as it is pretty bare-boned. The good thing though is that the accessories are not that expensive and will not cost much unless you go crazy. Driving the Go is a different experience as compared to the other cars in this segment. It has the most powerful engine in the segment and because the car is light, it can exploit that power easily. The supple suspension does make the car roll if you take corners too aggressively but it makes high speed travel easy as the car gobbles up bad roads. The steering wheel weighs up nicely as you speed up and is quite confidence inspiring. Please feel free to let us know what you think about the Best Hatchbacks in World Between 2 to 4 lakhs and stay tuned to ContentWorld for more such features and news.